I added a new 'Username with password' using the 'Add' button inside my project. I see it globally, but cannot select it from dropdown. I added a new 'Username with password' using the 'Add' button inside my project. I see it globally, but cannot select it from the dropdown. So, today, I went back into the Manage Credentials area of Jenkins, and I noticed there is a new credential type, 'Sauce Labs'. So, I went ahead and entered the credential here, as a 'Sauce Labs' credential, and now when I go into my project, it shows up in the dropdown list. See screen shot. So the issue is that the 'Add' button in the Sauce Labs plugin does not create the correct type of credential. It creates a username/password credential, instead of a Sauce Labs credential. M Chon added a comment - 2016-04-21 16:44 So, today, I went back into the Manage Credentials area of Jenkins, and I noticed there is a new credential type, 'Sauce Labs'. So, I went ahead and entered the credential here, as a 'Sauce Labs' credential, and now when I go into my project, it shows up in the dropdown list. See screen shot. So the issue is that the 'Add' button in the Sauce Labs plugin does not create the correct type of credential. 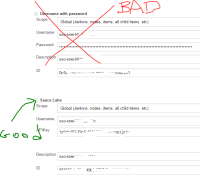 It creates a username/password credential, instead of a Sauce Labs credential. It has been pointed out to me that when clicking on the 'Add' button, in the screen which pops up, there is actually a dropdown menu where you can select the credential type. It just so happens to default to 'Username with Password', but 'Sauce Labs' is also on the dropdown. From a user standpoint, it would be much nicer if 'Sauce Labs' were automatically selected. Otherwise, the user might just go ahead and create a 'Username with Password' credential, which obviously won't work with the Sauce plugin. When the window to create a new credential pops up, 'Sauce Labs' should be pre-selected as the option. M Chon added a comment - 2016-04-21 18:16 It has been pointed out to me that when clicking on the 'Add' button, in the screen which pops up, there is actually a dropdown menu where you can select the credential type. It just so happens to default to 'Username with Password', but 'Sauce Labs' is also on the dropdown. From a user standpoint, it would be much nicer if 'Sauce Labs' were automatically selected. Otherwise, the user might just go ahead and create a 'Username with Password' credential, which obviously won't work with the Sauce plugin. When the window to create a new credential pops up, 'Sauce Labs' should be pre-selected as the option. It should but it is technically very difficult to enable that with the way Jenkins page rendering works. It was very tricky even getting the store selection button to display only those credential types that were applicable to the stores. M Chon added a comment - 2016-07-18 16:19 Thanks for looking into it.